Tribal Treasure tells the story of an explorer being cooked alive by an African native. The treasure is seen in the form of the gold Idol, which the explorer was presumably looking for. The Idol is the scatter symbol. The wild symbol is a ferocious looking native. The other symbols are Cooking Pot with the explorer inside, Monkey, Spoon and Bowl. High value card symbols from Ten to Ace also grace the reels with creepers twined around them. The reels are set in the background of a thick African jungle. The graphics are crafted in detail. The Native is shown salivating at the prospect of his meal. The wooden spoon and bowl are painted and decorated in typical tribal style. 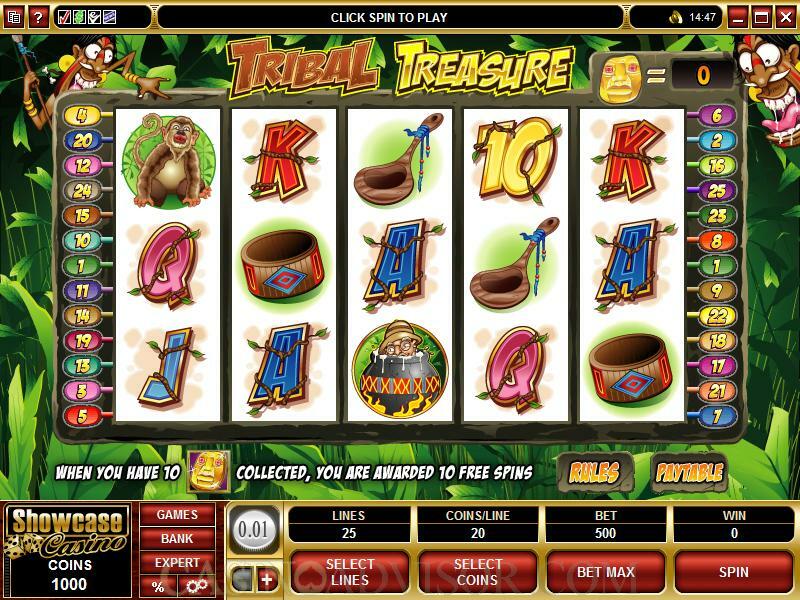 There is no background music in the base game but a pulsating tribal tune is played during the free spins bonus round. The animation in the Native symbol is interesting. The native breaks into a tribal dance accompanied by appropriate audio. The Idol scatter symbol lights up and glows. The other symbols do not show any animation. 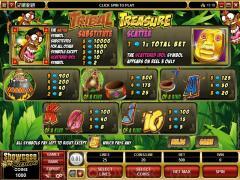 Tribal Treasure allows players to operate all three betting options. The coin size range is narrow with only four values of 0.01. 0.02. 0.05 and 0.10. This is somewhat made up by having up to 20 coins per payline. There are 25 paylines in this slot game. The Native is the wild symbol. It also offers the highest fixed jackpot of 10,000 coins. When four Native symbols appear from left to right in an enabled payline the payout is 1000 coins. The Native symbol does not act as a multiplier nor does it trigger any bonus feature. Tribal Treasure has an unusual scatter symbol in the Idol. It appears only on reel 3 and when it does so it pays out 1x the total bet. Every time that the scatter symbol appears in the base game it is collected. An indicator above the reels displays the total number of scatter symbols collected so far. When 10 scatter symbols have been collected the Free Spins Feature is triggered. 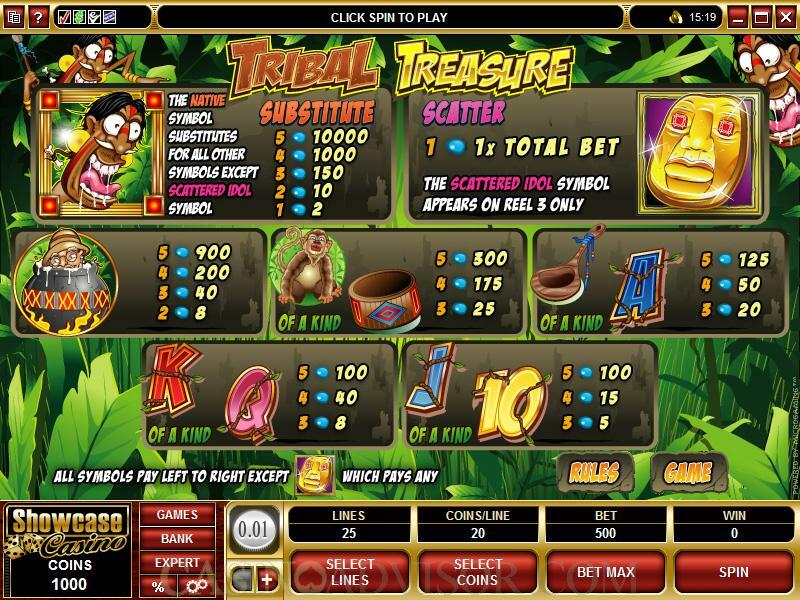 The player is awarded 10 free spins, one for each Idol collected. The payouts in the free spins are multiplied five times. The free spins cannot be retriggered. 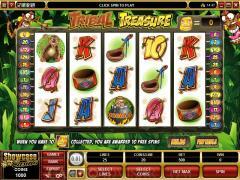 Tribal Treasure also has the Gamble Feature. After each payout the player can try to double the payout by guessing the color of the next card. He can also try to quadruple the payout by guessing the suit of the next card. If the player guesses correctly then the payout is doubled or quadrupled. If the player fails to guess correctly he loses the payout. The Gamble Feature can be played again and again till the gamble limit is reached. Tribal Treasure can be played in the Expert Mode. The highlight of this mode is the Auto Play facility. 5 or 10 auto spins can be availed by clicking the 5x or 10x button. For more auto spins the player has to go through the auto play set up. Interested in reading more detailed information about Tribal Treasure? If so Click Here for more details.